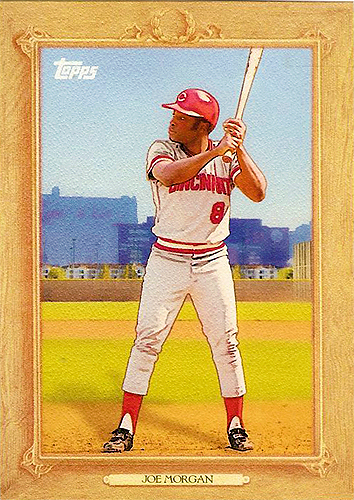 The cards I’m going to show you today were incredibly hot property in late 1988/early 1989. Ricky Jordan was a budding superstar. No kidding. Today he’s little more than a baseball footnote, but we were all convinced he was the second coming, and we weren’t the only ones. What’s even funnier, however, is that a lot of people had the other top Phillies prospect, Ron Jones, ranked even higher than Jordan, and Jones barely even scratched the Majors. 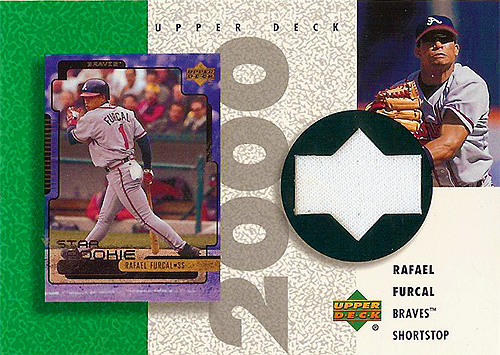 I guess that’s why Upper Deck chose Jones as a Star Rookie over Jordan? I never got that back in the day. But we’re not here to talk about Jones. 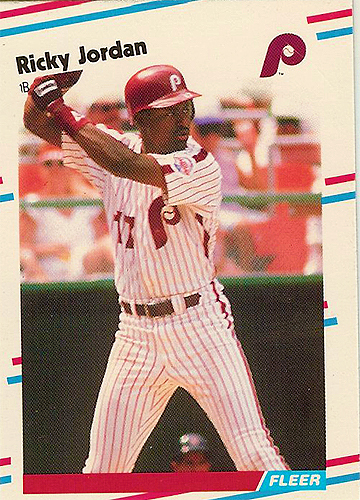 Ricky was a first-rounder for Philadelphia in the 1983 draft and started at Helena in the Pioneer League. Finding exact stats for that era is tricky for some reason, but it looks like he consistently hit .274 or above, but his SLG was a bit paltry for a first baseman: he never topped a .491 SLG. So why exactly was he a vaunted prospect? In fact, looking at his numbers, he would be considered an underperformer these days. 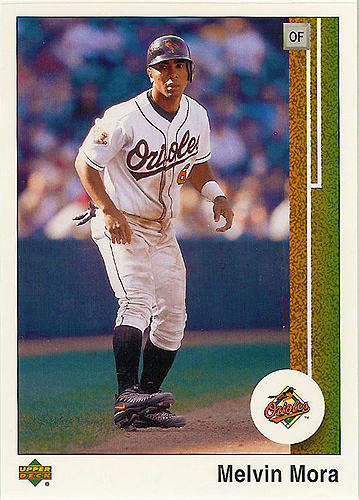 He made his major league debut on July 17, 1988, against Houston. He started at first and went 2-for-2 with a home run and two walks. Can’t get much better than that. 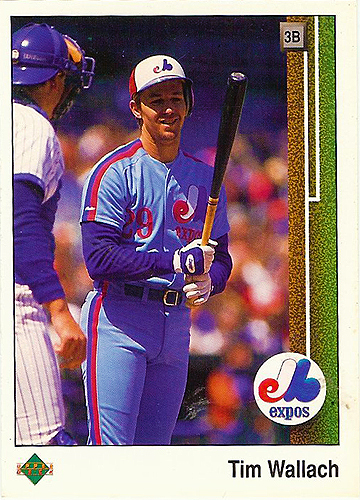 He went on to put up a .308/.324/.491 line with a 1.5 WAR in 1988, which may have contributed to his super prospect status. 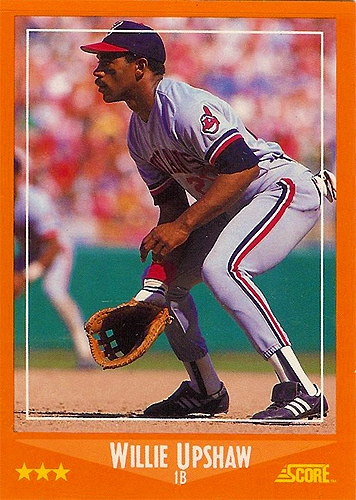 Given a full-time job in 1989, he dipped from an .815 ops in 1988 to a .724 ops in 1989. That meant he went from 131 OPS+ to 107 OPS+, slightly below average for a first baseman, but his glove really killed him in 89, dropping him to a 1.0 WAR. 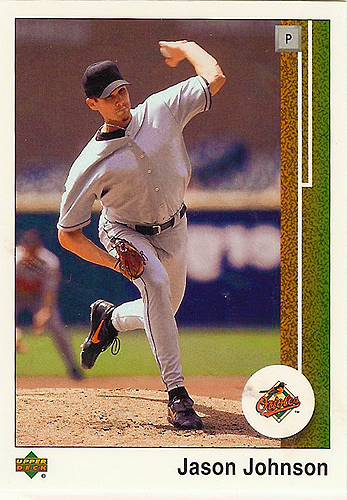 He was injured in 90 and thus mustered only a 73 OPS+ with a -0.5 WAR. He recovered, but was never the same batter. What little power he had had was sapped, which is just not a good thing for a first baseman with a weak glove. In fact, in four seasons he had the following injuries: a sore left wrist, an injury to his left hand and a fractured jaw. 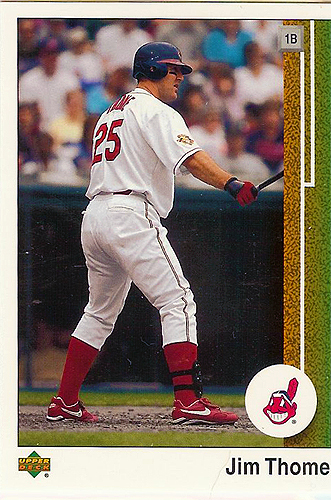 Two surgeries on his right shoulder (in 1995 and 1997) eventually ended his career. Slim pickings here, but I’m definitely going with the Score card. The photo is better, and his position isn’t all squashed near his hands. 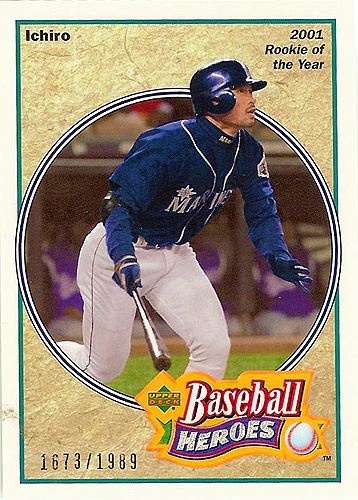 Plus, it was a holy grail card for us way back when. 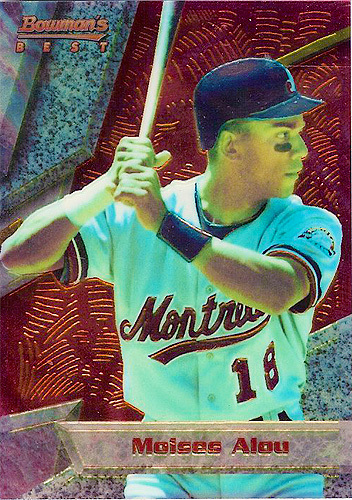 This time, let’s wander a bit afield of the 80s and even the early 90s as we start to get into the incredible mid-90s Expos teams and a pretty cool little set, 1994 Bowman’s Best. 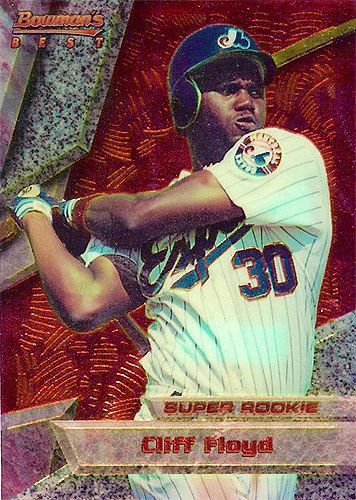 Of course, as with all chrome/refractors, scanning is a bit of a tricky process, so I’ve done the best I can to clean up these scans. There are two designs in the set, this red for veterans and “super rookies” (whatever those are) and blue for prospects. The design is very…odd, I’ll give you that, with lots of jagged angles and conflicting textures, but I like the artiness of it all. 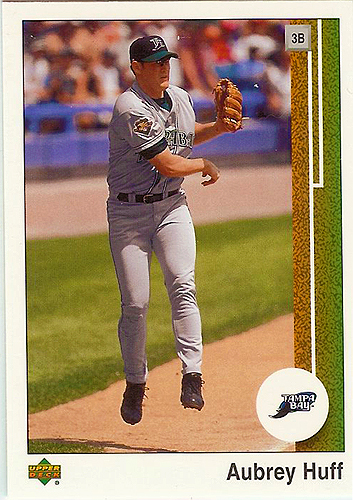 While Alou was a big part of the team in 1994, Andrews wasn’t yet, and would never quite be a big part of the team. 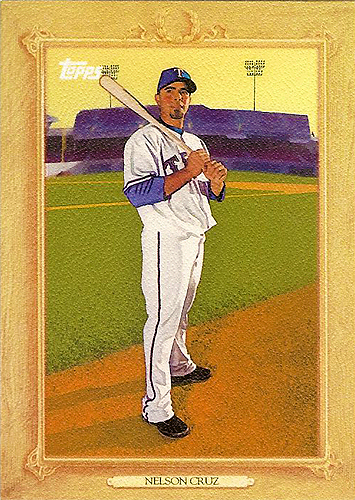 Despite that, I think this is a cool little card. 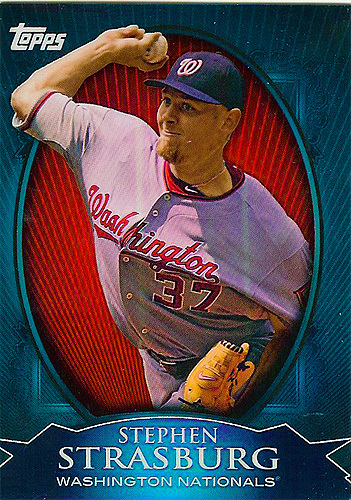 The blue jersey works really well with the overall theme of the card, even if it wasn’t intentional. It was so weird to open this set and see Eischen as a prospect. It’s hard to believe there may have been a time that was true, given how long he hung on with the club. Nice little nod to the guy. See, here’s what I mean about the super rookie designation. Floyd should have technically gotten a blue card here, but they went with that. I don’t know, I think I would have preferred the blue. The player choices for this set were a little odd, I have to say. We’ll see more of that when I present part 2 tomorrow. They covered most of the key players, I suppose, but there are a couple of glaring omissions. Still, I’m glad to have the set; I always kind of admired it from afar. 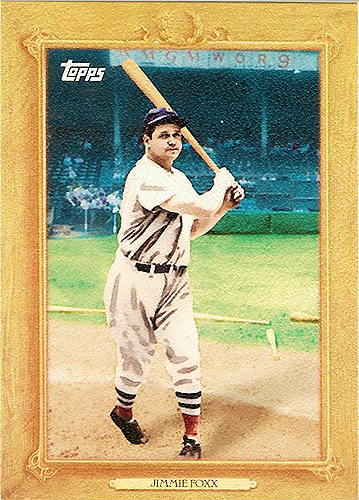 I mentioned in several posts this weekend that I busted some Topps Value Boxes…four, to be exact, as I was looking to get the entire Chrome set that comes exclusively in the set and was lacking only the Ruth at the end of the day. 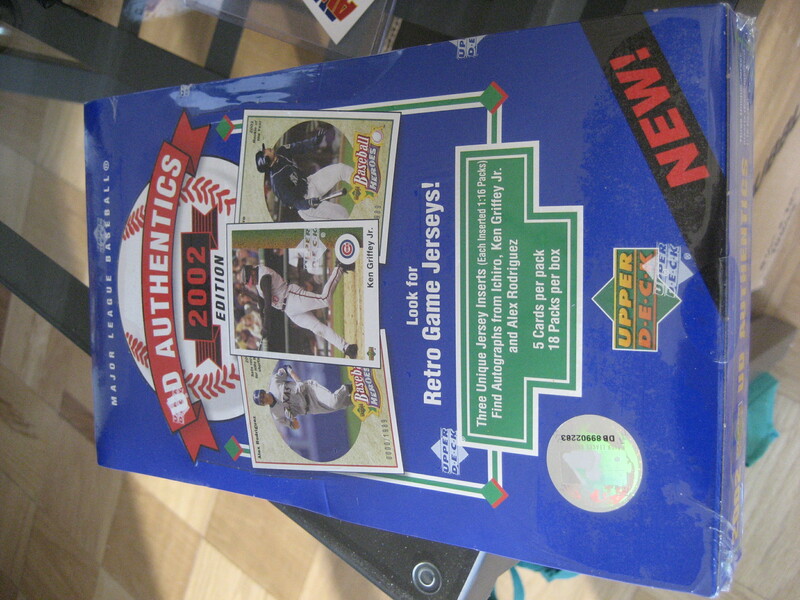 This was the also the first time I’d gotten Topps Million Card giveaway redemptions, so I was giddy about those. 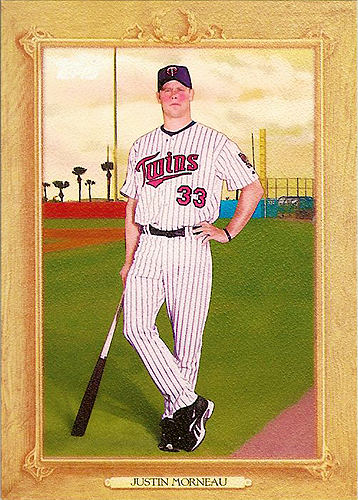 Didn’t get to scan the Ruth card yet, but yes, I have the entire set now. And I’m very pleased with it. 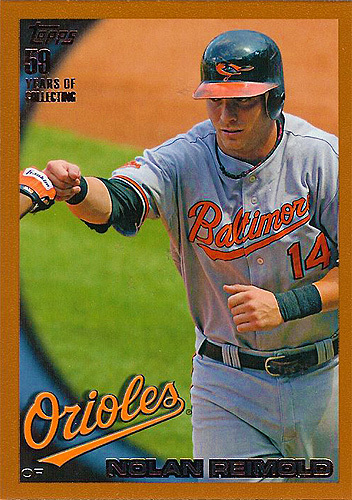 I’m a complete refractor whore, so I knew these were a must-have, especially with a National involved. 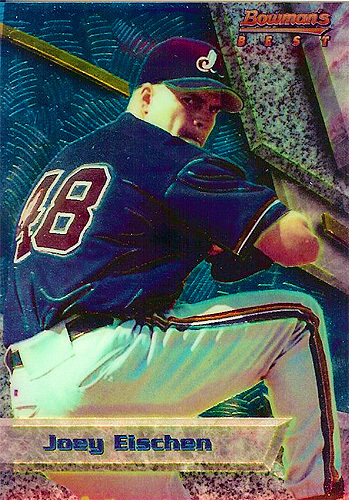 These copper cards are kind of cool, but the edges chip VERY easily, so they’re going to be incredibly condition sensitive as time goes on. But yeah, that was a pretty great box. 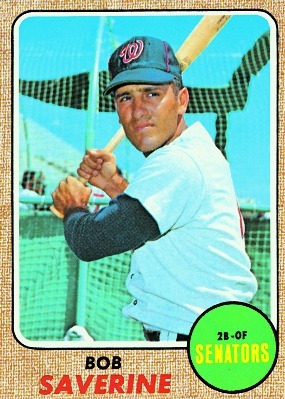 That card began its life as a Jose Vidal 1969, then was transformed into a Denny Lemaster 1967 and ended up here. I’m always happy with a new 68 card! Thanks for these, Topps. I haven’t disguised my love for this set, that’s for sure, and yet I’ve always found the boxes tantalizingly out of reach, either too expensive or difficult to find, so when I found a box going for an obscenely cheap amount on Ebay, I bid and sat on that auction. Yesterday the box finally arrived. 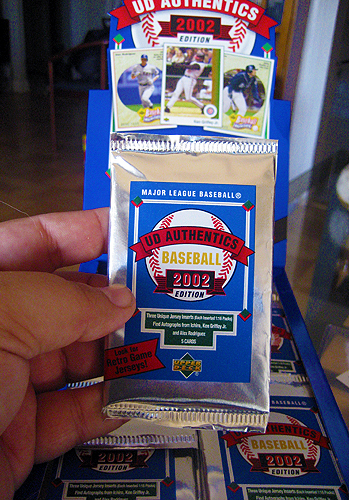 The whole thing gave me nostalgia goosebumps, down to the authentic (heh) feel of opening the first pack. And that’s A-okay by me. The reverse negative gimmick is easily the crappiest, most annoying thing about this set, as I’d have preferred to get the base Johnson, which I still don’t have. Sigh. Oh, I’m also okay with it because I not only beat the odds for relics on this box, I pulverized them. 1 in 16 packs, right? 18 packs in the box, so maybe, tops, I could have gotten two if I was extremely lucky. 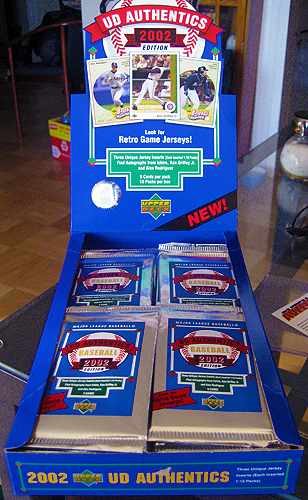 Yeah, I got four, including a reverse-negative game-used card and a gold reverse-negative game-used card. I didn’t even know the latter existed. My first ever hot box! 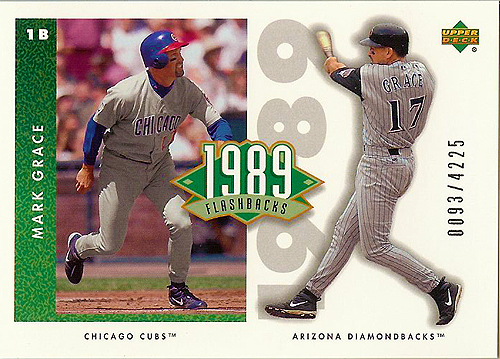 And a 1989 Flashback Mark Grace, numbered to 4225 (though that Cubs picture is more recent than 1989, he didn’t have that facial hair until the 90s). I also got a mess of base cards that I needed; only two doubles in the whole box, and a small stack of cards that I already had. Look for those cards to wind up in some trades in the near future. I’m still quite a bit short of the set, so I may pick up another box when I have some money. Overall, I give the box an A for the presentation, the hits, and the collation. Totally worth the money and exceeded my expectations. Oh, and all these cards save the base cards/reverse negative are available. 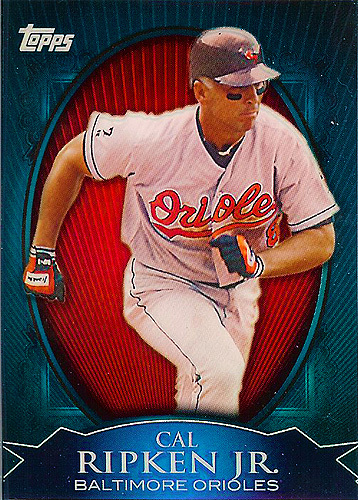 Willie will always be, for better or worse, the guy who blocked Fred McGriff at first base, but he wasn’t a half-bad first baseman. 1988, however, would be the end of a 10-year career. In 88, he was 30 years old and coming off of a season that had signaled his quick decline. He had dropped from a career-high .887 OPS in 1983 (and a 4.9 WAR, also a career high) all the way down to a .715 OPS in 1987, his lowest since 1981. He had also dropped to a 1.7 WAR by that point. 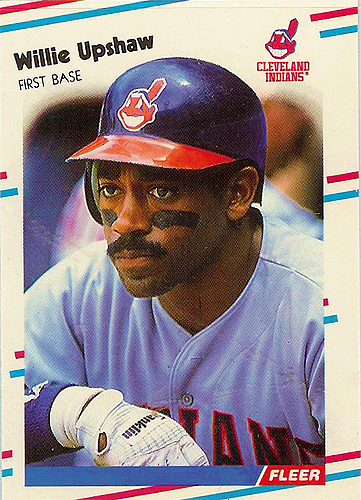 It was clearly time for McGriff to take his spot. 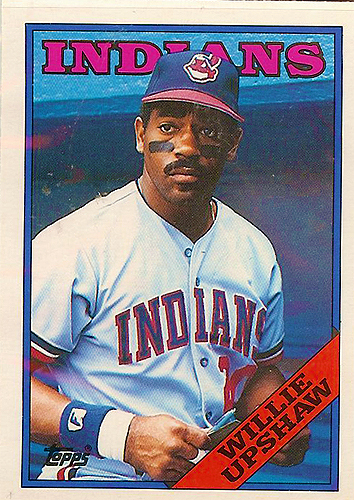 Willie was somehow purchased from the Blue Jays by the Indians (is this the term for when someone is just traded for cash?) 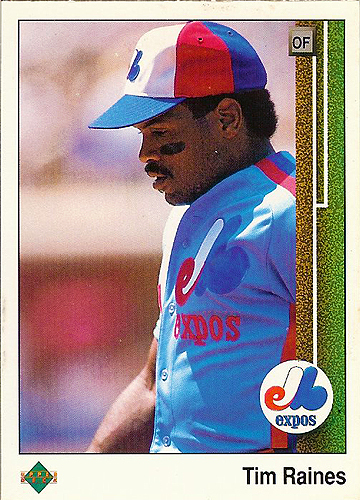 on March 25th, 1988 to make room for a McGriff/Cecil Fielder platoon. Isn’t that something to think about? Upshaw went on to a .699 ops, the lowest he had since he became a full-time player. In the meantime, Fielder did manage a 721 ops with a 100 OPS+ and 0.0 WAR in 1988, not world-beating, but better than Upshaw. The problem, if you want to call it that, is that McGriff had a 928 ops with a 157 OPS+, and his glove boosted him to a 7.2 WAR. Yeah, the choice was clear. So Willie’s major league career came to a rather sad end. He went to Japan after 1988, playing two seasons for the Fukuoka Daiei Hawks. I haven’t had any luck finding stats for those years, but he returned as a coach and manager; he currently manages the Bridgeport Bluefish. Out of these three, I have to go with the Score as my favorite. The others are just tired baseball poses, where this one has something dynamic going on. 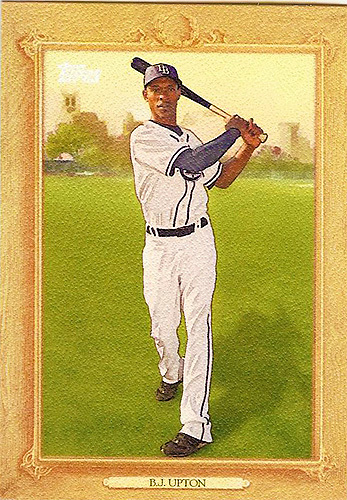 I never really thought much of Willie during his career, probably because he was finishing up as I was getting into collecting, but now I feel for him. His career ended pretty early, at 31. 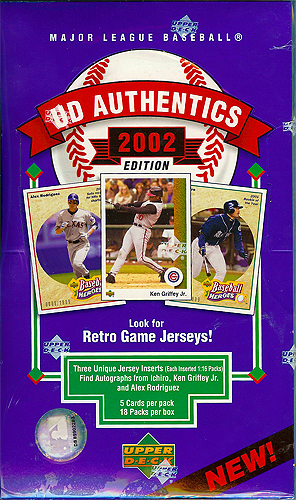 2002 UD Authentics. At last! 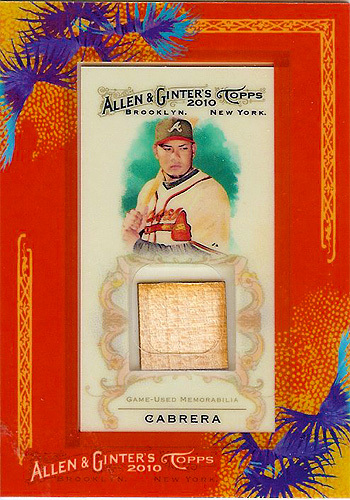 And it was a hot one; printed odds of a relic are 1:16 packs. I pulled four relics out of 18 packs. That’s beating the odds! I’ll show the pulls off tomorrow. 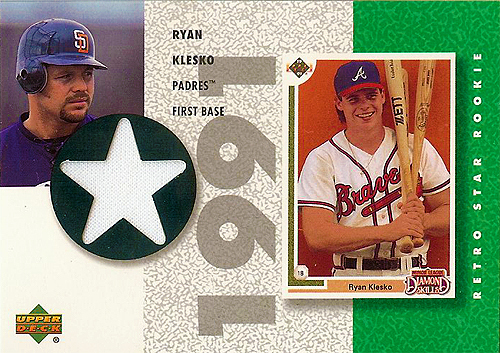 Man, team sets sure were bigger back in the day! Last entry. 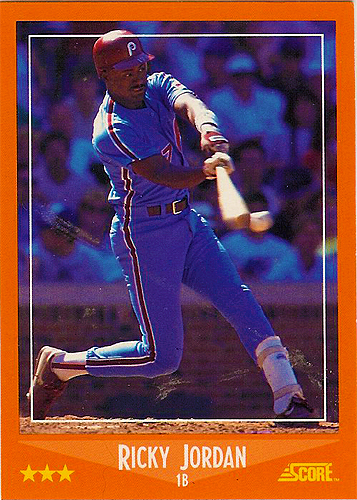 Can’t go wrong with a Tim Raines card, even if the shot is not particularly interesting. Or maybe it is? What is he looking at? Is he just coming back in from the field? 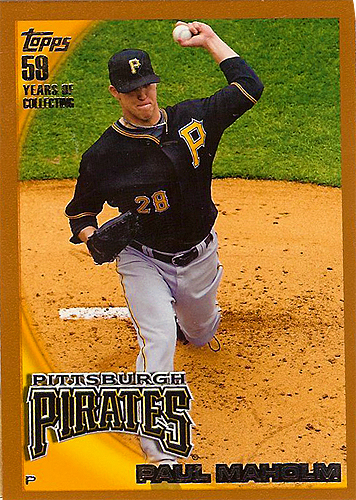 I love Tim and yet his 89 Upper Deck is a huge disappointment. This should be another boring shot, but at least it has someone in the background and puts you back in Spring Training. It sure as hell beats the Raines card. 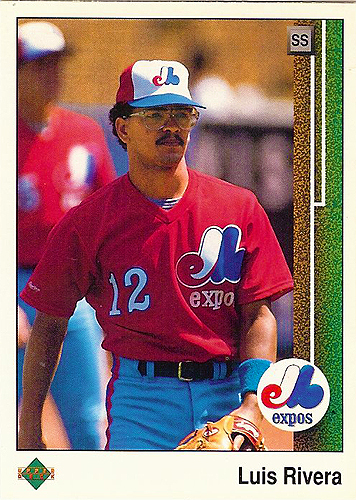 1988 was Rivera’s last year with the Expos, and he was…adequate, I suppose. Looking at his numbers it suddenly makes a little more sense as to why the team dealt for Spike Owen. Rivera wasn’t even that good with the glove. I’ve spoken quite a bit about Nelson recently, learning a lot more about his career in the process. Now we get a shot of him at the old Vet with Steve Jeltz in the background. 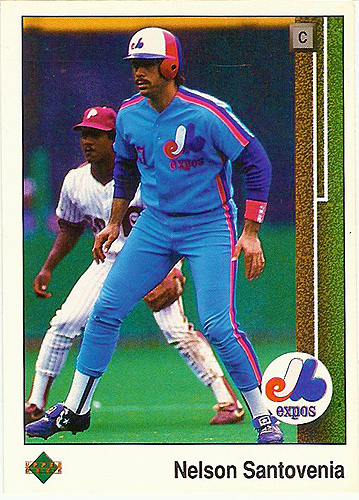 This is one of the great cards where you can pinpoint exactly when the shot was taken: September 25th, 1988, when the Expos played at the Phillies. 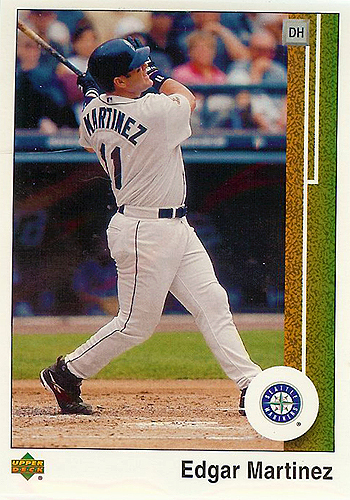 In fact, it was the top of the 2nd inning, after Dennis Martinez hit a single and got Nelson to second base, where Jeltz was playing shortstop. How cool is that? Yet another one of these shots. Mehhhhh. Okay so that’s a Mets uniform, right? I’m torn between it being a Mets uniform or a Cubs uniform. I strongly suspect the Mets given the stadium in the background. It would also be a damn cool photo if so, which would mean that’s Gary Carter behind the plate (and it kind of looks like him), and the old teammates are chatting before Wallach steps up. I can quite easily imagine that’s what’s going on here from Wallach’s expression. 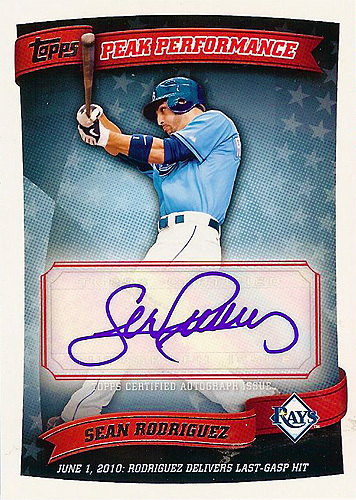 Adds some gravitas to a card that I always kind of liked. 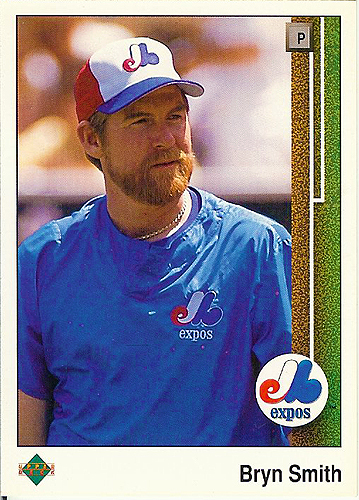 In fact, I’m coming to appreciate Wallach a lot more the more I collect the Expos. Last card of the set! Is that Veterans in the background? 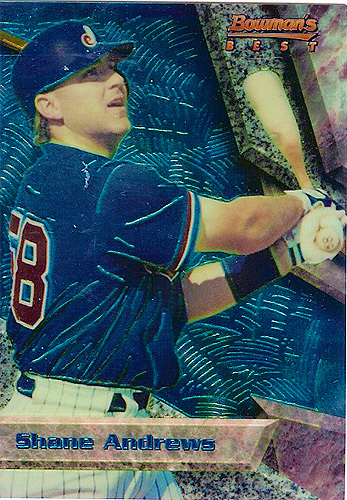 Of the away stadiums that Youmans pitched in in 1988, I’m thinking that’s the most likely stadium background there. If that’s the case, this would have been his June 15th appearance, when he took the loss. 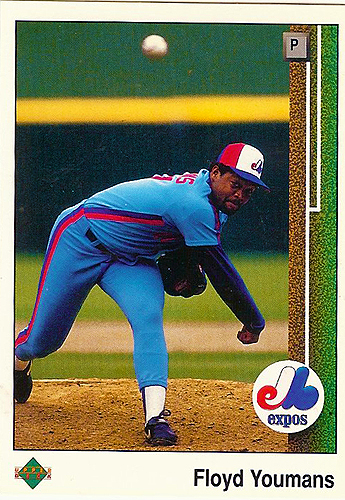 He only had more start left in his Expos career, so it’s kind of an important shot in his career. Design: 9/10 – I love the design, but of course it does have its issues. I don’t know if there’s a perfect design out there, but I love the 89 design. 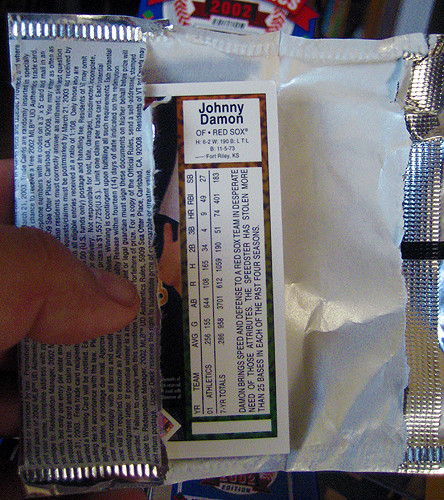 The baseline motif is very clever, and it provides some unusual colors (green and brown) to go with the generic white. I didn’t cover the backs here, but they’re truly my favorite part about the 89 set. Yeah, not full stats, but those larger pics on the back are well worth it. Player Choice: 10/10 – Nothing to complain about here. Covers every single player that meant anything to the team in 88. Photography: 6/10 – Some amazing shots mixed in with some very boring shots. 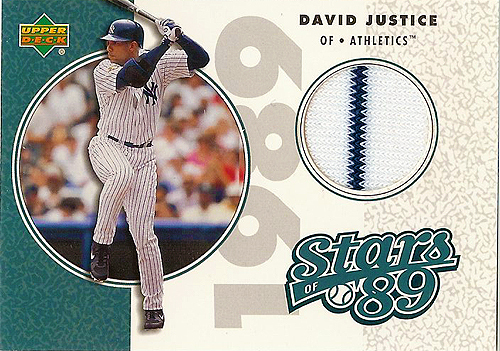 Unfortunately the boring shots predominate in this team set, but I think overall the 89 UD set has some great pics. 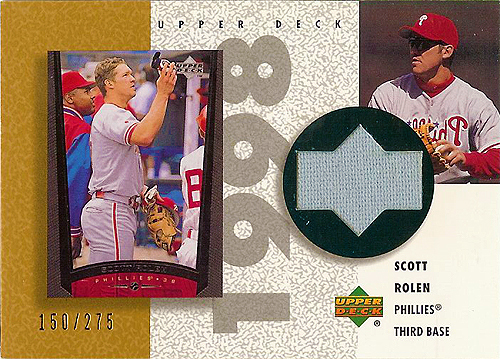 Total: 8/10 – Good selection, good design, and you can’t deny what this set did for baseball. I feel fortunate to have this team set.